by the United Nations Environment Programme (UNEP). 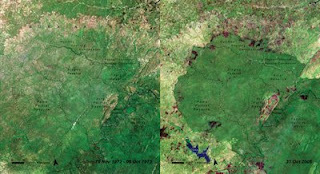 This Google Earth layer now showcases 187 sites around the world (over twice the original) with a special emphasis on environmental change in Africa over the past few decades. 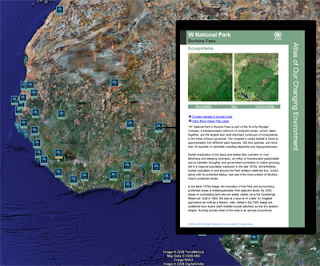 Tied to the recent publication of the 400 page book, Africa: Atlas of Our Changing Environment, this layer allows you to compare current and historical aerial and satellite imagery, read stories of environmental degradation and restoration, see photographs taken on-location, and leave comments about each site. Look for UNEP: Atlas of Our Changing Environment under the Global Awareness folder in Google Earth's "Layers" panel (just below the "Search" and "Places"). 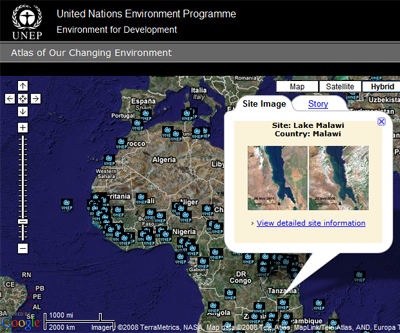 Or view the same sites on UNEP's Google Maps mashup. Check out locations like this one in Burkina Faso (below), where a population explosion in the late 70’s has increased farmlands surrounding national parks and hunting reserves. 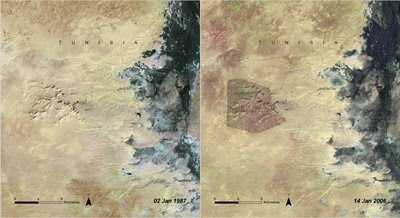 At this site in southern Tunisia (below), you can see the return of vegetation after the 1993 establishment of Sidi Toui National Park in southern Tunisia, preventing further erosion and desertification. You can also witness the appearance of road networks in the remote rainforests of the Democratic Republic of Congo, or the dramatic expansion of many West African cities. See the retreat of glaciers on Mt. Kilimanjaro, or the loss of highly biodiverse spiny forests to farms in Madagascar. The changes you will see around the world are really startling, especially considering most of the historic satellite images were take no more than 35 years ago. Explore these amazing environmental transformations and get a grasp on the larger story of humankind’s relationship to planet Earth. Read more about UNEP's environmental report and hardcover publication for Africa: Atlas of Our Changing Environment here. Today we are relaunching one of our oldest and most popular Global Awareness layers, the Altas of Our Changing Environment by the United Nations Environment Programme (UNEP). This Google Earth layer now showcases 187 sites around the world (over twice the original) with a special emphasis on environmental change in Africa over the past few decades.